Tara Beth Leach is the Senior Pastor at First Church of the Nazarene of Pasadena (“PazNaz”) in Southern California. 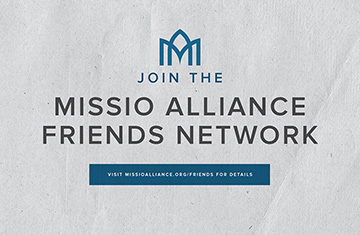 She is also a member of the Missio Alliance Writing Team. I recently sat down with her to discuss her new book Emboldened. Derek: Tara Beth, I appreciate your honesty and vulnerability in this book, what did you learn about yourself when you were in the writing process? Tara Beth: I learned a little bit more about my writing style throughout this process. Before this book, I mostly had written blog posts, sermons, and academic chapters and papers. Writing Emboldened was the first time I had written anything so personal, and I learned that I write much like I preach. I have a very exhortational style of writing, and this is not something I fully realized until I wrote Emboldened. Derek: I listen regularly to your sermon podcast and I read the book and you’re right! The voice I hear in your preaching is in this book. In processing your journey as a pastor, were there any personal discoveries you made or did writing this book confirm what you have come to know about yourself? Tara Beth: One personal discovery was something I was awakening to, and that was my deep love for the bride of Christ. I’ve always had a heart for the church, but through writing this book, my aches and longings for the bride of Christ to live into her fullness was amplified. Derek: Your heart is on full display in this book. You describe some of the pain and frustration you have experienced as a woman in pastoral leadership. What is one thing that may surprise readers about the life of a female lead pastor? Tara Beth: I don’t know that I can speak for all female lead pastors, so I’ll speak for myself. I put a lot of pressure on myself. There is often a great fear that if I mess up, it impacts other women’s opportunities. If I succeed, I’m succeeding for other women out there. This is a narrative that I have slowly been letting go of, but it impacts the amount of pressure I put on myself day-in and day-out. Not only that, but as a female pastor, there’s pressure to be the picture perfect mom, wife, cook (well, I’ve pretty much let that one go! ), and pastor. The Spirit is constantly reminding me that the world is not on my shoulders. Thanks be to God! Derek: Wow. That’s seems like quite a load to shoulder. What do you do to let go of all this pressure? Tara Beth: I stay in touch with a lot of women clergy, and especially a couple who feel the same burdens as I do. When I talk to them, I am reminded that I am not alone. Not only that, but the disciplines of daily prayer, Bible reading, and worship keep me grounded to reality. Derek: What is the first step a young woman should take when she is sensing a call to ministry? Tara Beth: Talk to your pastors and inner-circle, and ask them what they observe in your giftings. Ask for opportunities that match your gifts, and form friendships that could turn into a mentoring relationship. And of course, I always recommend pursuing seminary education. And remember, even when you think you’re an imposter, you’re not. You are called; you are gifted; and the Spirit will continue to form you and equip you for this calling. Derek: In the book you connect the need to embolden women in ministry to mission rather than justice. Can you explain the difference? Tara Beth: Well, justice is still really important in this conversation. Really important. However my hope in this chapter was to reframe the conversation. When it comes to justice, in the western ideological context, we tend to focus on human rights and equality. This is good. It’s important for order, safety, protecting the vulnerable, and equality. And of course, justice is a major theme in the Bible’s big story. But we can’t stop at justice. If justice were the single goal, then perhaps our focus would be reduced to pushing for an equal number of men and women into the pulpit without any sort of testing, discerning, and approving. I love the way Christopher Wright talks about the mission of God when he says, “Mission, while it inescapably involves us in planning and action, is not primarily a matter of our activity or our initiative. Mission, from the point of view of our human endeavor, means the committed participation of God’s people in the purposes of God for the redemption of the whole creation. Mission is God’s. The marvel is that God invites us to join in.” The marvel is that the whole bride of Christ is invited to participate in the purposes of God for the redemption of the whole creation. The way I see it right now, some 90% of the church is being held back. Derek: You address both women and men in this book and in chapter nine you offer men practical steps for emboldening women in ministry. What is the one thing men in church leadership can start doing immediately to have the greatest impact in the lives of women in ministry? Tara Beth: Immediately begin praying and discerning about who the gifted women in your midst might be. Seek them out, encourage them, and mentor them. Through mentoring them, give them opportunities to use their gifts of teaching, leading, and preaching. Point them to seminaries, books, and resources. Even if your gifts aren’t encouragement, do it anyway. Women need your affirmation and observations. Derek: What is it about the shape of our current cultural context that makes this book a must read for Christians who care deeply about the church and our mission? Tara Beth: There are countless churches who “affirm” women in ministry, but function as though they are a complementarian church. In other words, they continue to have male-only leadership, male-only platforms, and women continue to be sidelined in their own churches. We can do better. The church suffers when only half of the team is engaged in the mission. Derek: The emergence of the #MeToo movement has brought to the surface the value in giving voice to women who have suffered. In what unique ways does Emboldened give a voice to women in ministry? Tara Beth: Sometimes hearing the words “me too” can be one of the most validating words to hear. Often times being a woman in ministry can feel incredibly isolating and lonely. But when we discover that we aren’t alone after all, and when we discover we are apart of a gifted, called, and anointed sisterhood, we are emboldened to live into the fullness of what we have been called, equipped, and empowered to do. Emboldened names some of the many “me too” experiences that women often navigate in the journey to and in ministry. It is my prayer that women reading Emboldened will discover that they are not alone. If you’d like to hear more from Tara Beth and several other Christian leaders on this important topic, we invite you to join us for this webinar on Thursday, Feb. 22, 2018 at 11:30ET. Click the image for more info. and registration.